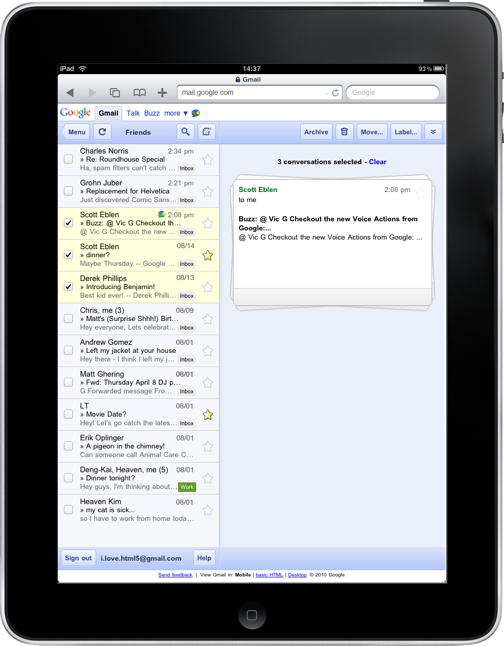 The Iterative Web App: New Stacked Cards Interface for Gmail on iPad. In April 2009, we announced a new version of Gmail for mobile for iOS and Android. Among the improvements was a complete redesign of the web application's underlying code, which allows us to more rapidly develop and release new features that users have been asking for, as explained in our first post. Today’s topic for the The Iterative Web App, a series where we continue to release features for Gmail for mobile, is the Stacked Cards Interface on the iPad. When we announced our new interface for Gmail on the iPad, we requested feedback on how we could improve this experience for tablet devices. In June, we responded with a new compose screen. Today, we’re addressing the top feedback by launching a new “stacked card” interface for selecting and managing multiple conversations. In the past, performing actions on selected conversations was awkward. There were two similar toolbars on the screen: one on the bottom left and the other on the top right. The former affected the selected conversations, while the latter affected the currently open conversation. Since the toolbars’ buttons looked similar, it was easy to mistakenly use the wrong toolbar. Sound confusing? It was. In the new interface, selected conversations are displayed stacked on the right panel for easy organizing, archiving or deleting. The second toolbar is gone so it’s always clear which conversations you’re working with. This new interface has also been an opportunity for our team to experiment with CSS3 transitions, which give mobile web applications a similar look and feel to native applications. More details on the implementation are posted on the code blog. To try the Gmail webapp on the iPad, just go to gmail.com in Safari. For quick access, create a homescreen link. Please note that the new interface is only available in US English for now. How about a similar version for android tablets??? Oh and a version for android that lets you select the email address to send mail from if you have multiple accounts set up under the one gmail account (only the desktop web version supports multiple email addresses under one account). Would be very useful to many people! Are Google Apps for Domain users able to use this? So far we've been unable to use the mobile interface. It looks great; I commend the effort. But who uses web-based mail on the iPad? T - I don't have an ipad here, but i know on my iPhone there are webapps/pages that "don't scroll" because of frames or another issue with a single finger scroll. What happens in docs if you double-finger scroll up/down? I too would love to see a version of this for Android as well. You can also check out this interface from a desktop PC, via Safari. Install Safari, then hit Edit / Preferences and click the Advanced tab. Click to show the "Develop" menu. Click OK.
Now in the main Safari screen, hit ALT (to bring up the menu, it's hidden by default) and click Develop, under the User Agent menu, select Mobile Safari for iPad, iPhone, or iPod Touch. There you have it, you can check out Gmail, Local Search (very useful to us in Local Search SEO), the whole WEB - as if you were on your iPhone/iPad, right from your desktop PC. Doesn't work on my iPad. Is it being rolled out slowly? Best mail app for iPad so far! Only things left are selecting sender address when composing and hiding that annoying safari address bar.